After slashing and spreading the pattern the necessary amount, "true" the lines of the pattern....as shown by the black lines. These changes add ease just where it is needed, without having to move up to the next larger full pattern size. It's no wonder some collars have their allowances "all in a bunch" ...there isn't enough room in the point! 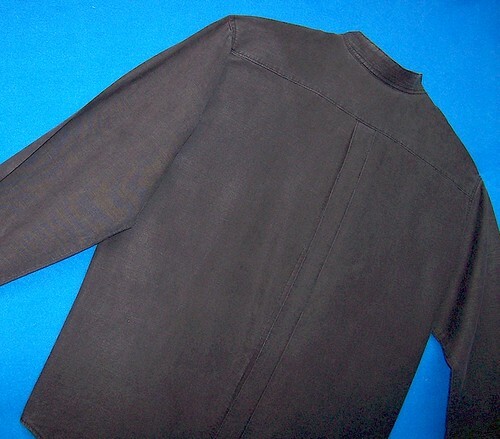 One way to help collar seam allowances have the room they need to stay nice and flat with no lumps is to "open" the point of the collar pattern. Notice the diagram of the collar pattern shown to the left. The black outline is the original pattern. The blue line shows how to alter the angle of the point. Trace a copy of the pattern, *without* seam allowances. Locate the neck-edge Center Front. This will be your "pivot point", as shown. Make a mark, 1/8" to 1/4" -IN- from the collar's -TOP- edge point. 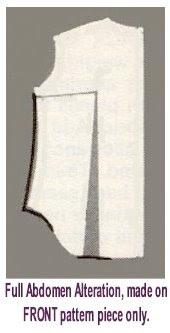 Draw a line from the neck-edge -CF point- up to the mark made at the collar pattern's TOP edge...shown as the blue line in the diagram. Cut along this newly drawn line to complete the pattern alteration. Don't forget to add seam allowances! The length and shape of the neck-edge of the pattern has not changed, all the "parts" will stitch together as usual. 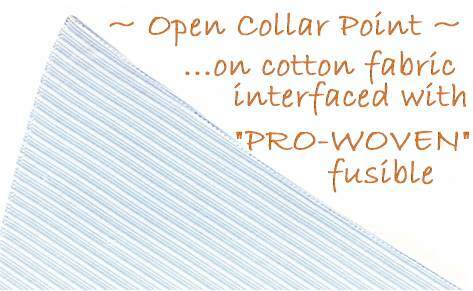 This simple method will work with any collar, including shirt collars that are attached to a stand. Changing the angle of the point by such a small increment will not affect the collar's "fall". Remember, all that's been done is a very slight change to the angle of the collar point, giving its seam allowances more room to settle flat and smooth when the collar is stitched and turned. The blue shirt collar shown to the left is an example of how sharp and smooth a collar can be when the angle of the point is opened a bit. Of course, there are other techniques that help a shirt/blouse collar look sharp and professional, but changing the pattern is a good place to start! I made this set as part of her "Birthday Wardrobe." 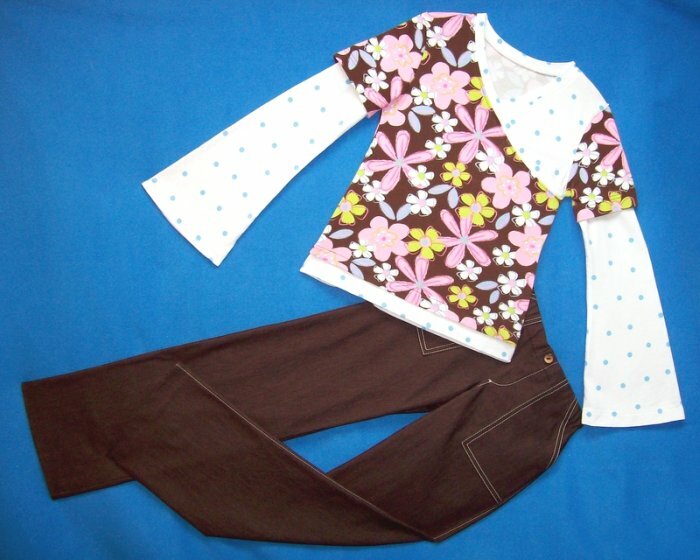 This outfit was made with Ottobre Design patterns that I changed liberally to suit my design whim of the moment. 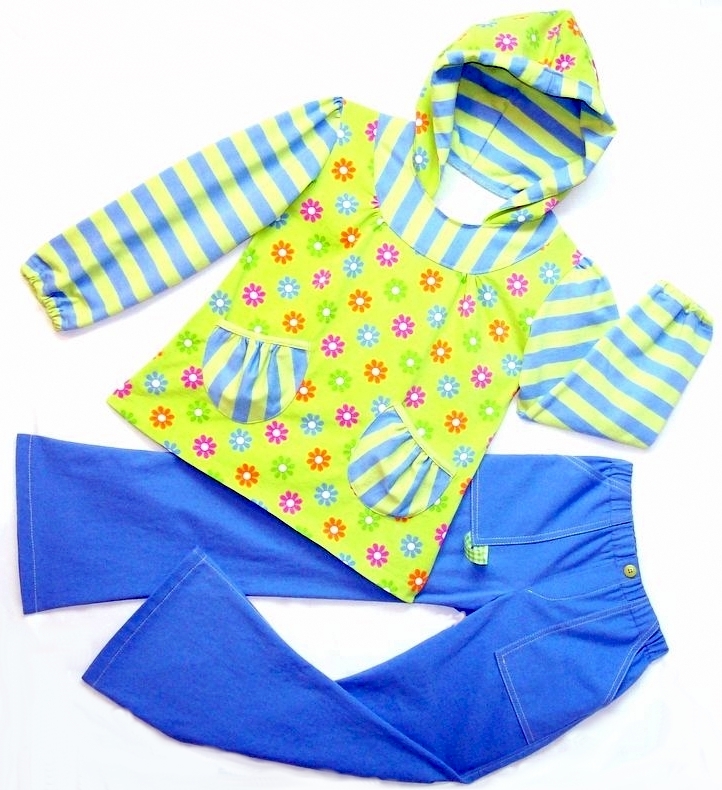 The Hoodie is from issue 04/07, #16, made with Chez Ami fabrics. The Pants are the elastic waist pants pattern, issue 03/03, #23, made from cotton twill. 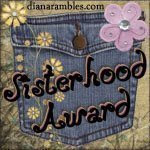 Lori from Girls In The Garden has graced me with this this award. Thank-you Lori....you are a constant source of design inspiration and one of the most talented sewists I know! Yes..I know that's just 7...but what can I say? I'm a rule-breaker, LOL! 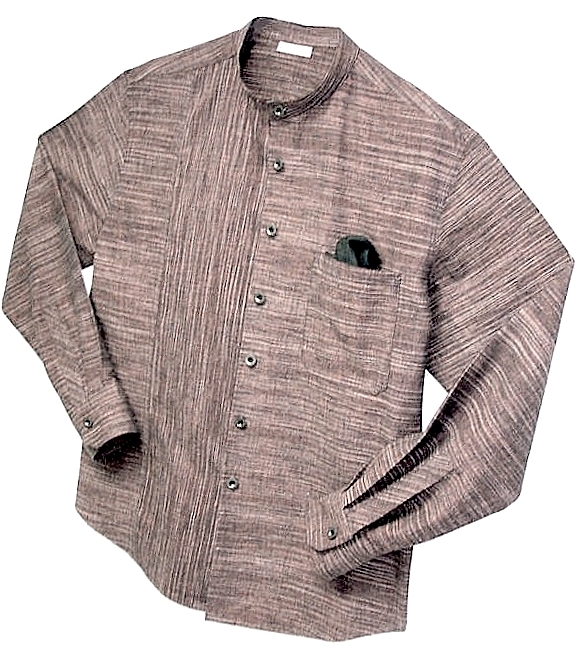 This shirt style is a perennial favorite among many of my clients. 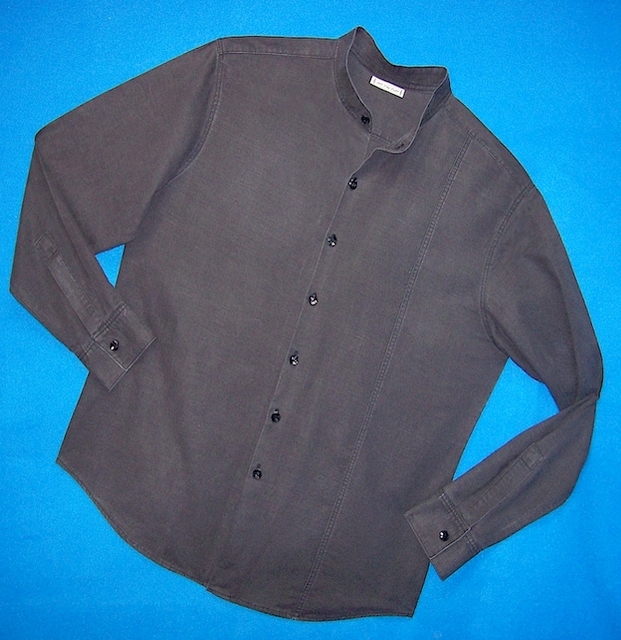 Made from a richly textured blend of silk and hemp, this original design features a "Prince Seam", a narrow band collar, pewter buttons, and angle edge cuffs and pocket.